Decent shockmounts can actually improve the sound you get from your mics, but they can be expensive and not always durable. Rycote aim to solve both problems with their new designs. Anyone who has used a microphone will be aware of the considerable ease with which it can capture unwanted mechanical vibrations — either from hand‑holding or up through the mic stand. Those vibrations, often subsonic in nature, act to muddy the sound and steal much needed headroom from the preamp. 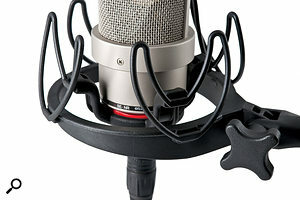 The long‑adopted solution is the microphone 'shockmount', which can appear in a variety of different forms, the most common and instantly recognisable being the 'cat's cradle' shockmount, in which an inner section clamps to the microphone and is suspended from an outer ring fixed to the mic stand by an array of elastic or rubber cords. Such designs can be very effective, but they're not quite as simple or straightforward as they might initially appear. The idea is to attenuate significantly any very low-frequency vibrations that arrive at the outer suspension ring, preventing them from reaching the inner ring that supports the mic. But microphones are not equally sensitive to vibration in all directions: the plane perpendicular to the diaphragm is by far the most critical — and very few shockmount designs take that into account. Moreover, the weight (or mass) of the microphone interacts with the elasticity and dimensions of the suspension to determine the resonant frequency of what is basically a heavily damped mass‑spring system — and the resonant frequency has to be very, very low in order for the suspension to be effective at audible frequencies. So the suspension should be designed for a specific range of microphone mass; a generic, 'one‑size‑fits‑all' shockmount that works equally well with any microphone is a physical impossibility. Similarly, any changes in the elasticity of the suspension — for example, as the material ages and stretches, or if it is replaced with a material of different specifications, or if it is fitted too tightly or too loosely — will drastically affect the resonant frequency and damping. In a worst‑case scenario, a badly designed or set up shockmount could actually make the problem of subsonic mechanical vibration pick-up worse, not better! This is where a small, family‑run company called Rycote enter the picture. They've been producing the world's most advanced shockmount and windshield systems for the most demanding professional environment (location film and TV shoots) for over 30 years. Nothing tests a shockmount quite as well as swinging a foot‑long mic at the end of a hand‑held, 10‑foot pole above blockbusting feature‑film action scenes! Always an engineering‑led company, Rycote advanced the technology of shockmounts dramatically in 2007, when they invented and developed a unique shockmount suspension system called the Lyre suspension. Brilliantly simple, fantastically effective, and completely customisable to suit different microphone weights and sizes, that same Lyre suspension system was subsequently adopted for Rycote's first studio product, introduced at the start of 2008: the superb InVision series of shockmounts, which cater for a very wide range of small-diaphragm microphones. The Lyres' brilliant design allows movement in all three axes, but the unique shape and material allows the compliance in each direction to be controlled. So while movement in the up‑down axis might be restricted to 1mm, it can be four times that in the sideways axis, providing stable control of the microphone's orientation. But in the critical fore‑aft axis, perpendicular to the microphone diaphragm, the freedom of movement can be as much as 10mm, enabling the diaphragm to remain at a fixed point in space almost regardless of the movement of the mic stand itself! Hence stand vibration has much less influence on the diaphragm, so subsonic noise is greatly attenuated. Of course, having a flexible mount is not the only critical aspect: the way the movement is damped is also very important. Elastic and rubber suspensions are inherently damped, but the actual parameters are difficult to control and vary wildly with different batches and materials. In contrast, the Hytrel used to form Rycote's Lyres is extremely consistent and controllable, and virtually indestructible, too! Also, unlike elastic or rubber suspensions, Lyres have a very low inherent tension, which means that the resonant frequency can be extremely low too (below 8Hz even with miniature capsule microphones), so they provide superb isolation across the audible frequency range, essentially providing an extra octave or so of clean bass. I don't think I've ever seen any mic manufacturer publish test results to demonstrate the effectiveness of their shockmounts, but Rycote do — and very impressive they are, too. The small‑diaphragm InVision mounts are sold with different Lyre types and different base plates to suit different sizes and weights of microphones, exactly as they should be. And on testing them with my own microphones, and against some scarily expensive manufacturers' own shockmounts, they consistently proved to be more effective — and very significantly so, in some cases. Needless to say, I ended up replacing almost all my stock shockmounts for my large collection of small‑diaphragm mics with the appropriate InVisions, something that was practical because of their affordable pricing. The 'USM' universal version of the InVision shockmount uses swivelling pads that give a firm grip capable of supporting almost any large‑diaphragm mic. That was a long introduction, but it's important to set the scene properly so that you can understand the advantages and benefits of Rycote's new product range. Clearly, with the InVision mounts for small‑diaphragm mics proving so effective and popular, it was only a matter of time before the company announced a version intended for large‑diaphragm studio mics — and that time has arrived, after more than two years of development. However, whereas small‑diaphragm mics are all of a similar shape and a relatively narrow range of sizes and weights, large side‑address studio mics come in all shapes and sizes. Some are designed to be mounted via a screw thread at their base, while others are intended to be clamped around their midriff. Then there's the mind‑bending question of how you can support a side‑address microphone using Lyre technology, to provide the required spatial support while maintaining the appropriate axes of movement. Rycote's answer comes in two forms: the InVision USM and the InVision TLM. They both use the same Lyre suspension technology, but the USM version has four precision‑made stainless‑steel screw clamps with soft rubber pads, which can be adjusted to fit almost any microphone shape and profile within a range of 18‑55mm — and to hold it with total confidence in any mounting orientation. The TLM version (pictured at the start of this review) is designed for microphones with threaded bases, including some well‑known Neumann models. There are also two different grades of Lyre, to provide the appropriate damping for heavier or lighter microphones. Like many cat's cradle shockmounts, the InVision USM and TLM models employ two concentrically mounted (plastic) rings. The outer ring is fitted with a microphone stand adaptor, complete with a spring finger to clamp the mic cable. It is threaded for European 3/8‑inch stands, but ships with a 5/8‑inch adapter. Mounted on the NE, SE, SW and NW compass points relative to the stand mount around that outer ring are four large lyres, the upper centre point of each being fixed to the inner microphone support ring. In the TLM version, that inner ring is deeply cupped and houses a rotating threaded insert for a range of microphones including the Neumann TLM103, 127, 193 and others. Rycote will probably produce models with alternative threaded inserts to suit other mics as demand grows. The USM (Universal Shock Mount) version has a flat inner suspension ring, with the four screw clamps protruding between the Lyre mounting points. The pads pivot to accommodate angled microphone sides, and their rubber surfaces ensure a remarkably stable grip with very little pressure. (In fact, the knurled control knobs are very small, to minimise the risk of over‑tightening!) Mounting a microphone in the USM is simple, if slightly fiddly at first, but I've known manufacturers' mounts that were harder to use. The important point is to set the height so that the centre of gravity lies close to the level of the outer suspension ring, for optimal balance and control. I tried out these new shockmounts with my range of studio mics, from the tiny Gefell M930 to the enormous SoundField, and from the angular AKG C414 to the conical CAD M179, and the tubular Blue Baby‑Bottle and AT 4040. I also tried it with a Sennheiser MKH30 which, although technically a small‑diaphragm microphone, has a side‑address, figure‑of‑eight capsule that doesn't suit the standard InVision mounts. Finally, I tried out the TLM version with Neumann's TLM103 and TLM102. I had no problems fitting any of my mics to the USM mount: it coped perfectly with every size and shape. The ability of the clamps to grip without crushing the microphone body is impressive, and my slight initial nervousness over suspending mics in the USM mount above expensive instruments quickly evaporated. For the stiff Lyre model, the maximum weight (750g) that can be supported vertically (including upside down) is reduced to 500g when the mic is oriented horizontally, because the Lyres have a greater degree of flexibility in that direction, and the inner frame will make contact with the outer ring if overloaded. My initial tests comparing the mic manufacturers' shockmounts with the InVision USM revealed a degree of variation I wasn't expecting. In most cases, the USM was far better at attenuating stand‑borne vibration, while in others the differences were less marked. Further investigation revealed that in several of these cases the microphones had additional internal capsule shockmounting, compensating, to some degree, for poor external shockmount performance. The others involved smaller, lightweight mics (specifically the M930 and MKH30), where the standard Lyres were too firm to give adequate isolation. Switching to the alternative USM‑L version, with more flexible (red) Lyres, provided the level of isolation I achieved with the larger and heavier mics on the standard system. Thankfully, Rycote's web site provides a table of compatible models for each USM and TLM variation, so there's no guesswork needed on the part of the buyer! It's surprising, but very few manufacturers' studio shockmounts provide cable clamping. However, given the weight and stiffness of typical studio cables a lot of vibrational energy reaches the microphone via this route, effectively short‑circuiting the suspension completely. Rycote's understanding of the physics of shockmounting led them to provide a simple but efficient cable clamp on the stand adaptor to trap cable vibrations, preventing them from reaching the mic. Better still, the company can provide optional lightweight and flexible XLR tails to install between the mic and the studio cable, to reduce vibration transmission even further. This approach is standard in their location sound windshield/mount sets, and is a well‑proven technique where mics are used in high‑vibration situations. Mounting appropriate mics in the TLM InVision is a little quicker and easier than the USM version, and I found it very effective with the TLM103, providing noticeably better results than Neumann's standard shockmount. The standard TLM model was less effective with the TLM102, but I think that's because the mic weighs half as much as the TLM103, and I suspect the more flexible TLM‑L variant would be beneficial. That wasn't available in time for the review, but is now in production, and tests have apparently shown it to work well with the TLM102. Microphone suspensions don't have flashing lights or attractive GUIs, so they often fall below the radar when it comes to buying recording equipment. However, the principle of optimising the recording from the microphone onwards is critically important, and besides choosing and placing the microphone carefully, mounting it to minimise mechanical vibrations is vital in achieving the best possible sound quality from the source. In my experience, the shockmounts associated with high‑end mics generally work well but are often prohibitively expensive and usually sold as accessories. In contrast, most budget mics seem to be shipped with generic shockmounts, but they are frequently ridiculously crude and can be disappointingly ineffective. Which Shockmount Do I Need? For microphones measuring 18‑55mm (width) and weighing 400‑750g. For microphones measuring 18‑55mm and weighing 0‑400g. Suitable for the following Neumann models: TLM 103, TLM 127, TLM 193 & M147. Suitable for the Neumann TLM 102. Clearly audible and measurable subsonic vibration isolation benefits. Virtually indestructible materials and construction. USM model accommodates virtually all side‑address mics with ease. Confidence‑inspiring levels of grip and stability from the four screw‑pads. Highly effective and simple-to-use cable clamp. Alternative Lyre stiffness models available for lightweight microphones. TLM versions available for convenient mounting of threaded‑base microphones. There is a definite knack to installing mics in the USM version. It takes slightly longer to install a mic in the USM than in most manufacturers' shockmounts. At present, the TLM version only fits some Neumann mics. 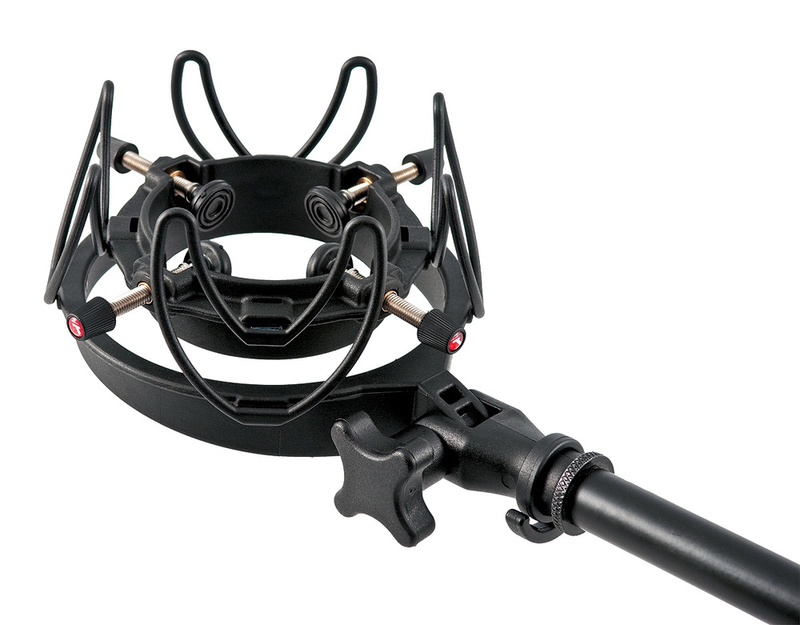 This is a very elegant and well-engineered shockmount for large‑diaphragm studio microphones, and builds on Rycote's unique and innovative Lyre technology. It delivers state‑of‑the‑art performance at an affordable price that makes it a cost‑effective purchase to support budget mics as well as high‑end models. All models £74.95 each including VAT. Redding Audio +1 203 270 1808.